Warehousing in profit-oriented environments requires handling complex constraints for planning, organizing, or managing tasks. A large amount of input causes a high degree of complexity, as in the case of the management of customer time windows to accurately deliver them their products. This problem is the well-known order picking problem (OPP) with timetabling constraints, and this chapter proposes a tri-objective optimization model to handle it. The novelty of the approach involves 1) incorporating preferences to search the best compromise of OPP, 2) facing any number of OPP constraints as tri-objective optimization model, and 3) dynamical feedbacking from changes in the state of preferences due to possible interactions with a decision maker. This chapter offers a theoretical analysis of the advantages and disadvantages of the proposed model regarding the new features, which, according to the literature, has not been used so far. The three basic functions that appear in the storage of the warehouses are the transfer of goods, the lodging of goods and the transfer of information. In particular, the flow or movement of goods has received the most attention from organizations, due to its focus on improvements in their inventories and the accelerated delivery of orders. 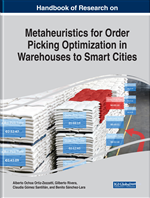 According to de Koster, Le-Duc and Roodbergen (2007) and Lambert and Ellram (1998) the warehouses have five main functions or activities, which are receiving, transfer, order picking, cross-docking, and shipping. These activities are necessary for the warehouse and involve constraints that vary in complexity (cf. Horvat, 2012; Bortfeldt and Wäscher 2013, Bódis 2017); the impact of such activities is described below. The activity of receiving is related to the unloading of products of the vehicle towards a reception center, the updating of warehouse inventory records, damage inspection and verification of the goods count against orders and shipping records. The transfer activity is responsible for the transfer of products from the reception center to the corresponding locations of the products in the warehouse and the transference to specialized service areas (consolidation and outbound delivery). The order picking is responsible for satisfying customer orders and picking the products from the warehouse to an order center. The cross-docking activity avoids storage by transferring elements from the receiving dock to the loading dock, it avoids the preparation of orders, and it generates a great impact on cost and customer service. The elimination of the transfer of products reduces the cost and time that the products remain in the warehouse, improving the levels of customer service. Finally, shipping is responsible for loading the products in vehicles that are ready to distribute the product to the customers, which involve the movement and physical organization of the products, the adjustment of inventory records, the verification that the orders are sent, sorting and packing the items for the customers, and marking them with the necessary information for the shipment (origin, destination, sender, consignee and package content). Order picking, as mentioned above, is an activity that consists of the retrieval of products from storage to meet customers’ demand. In the warehouse, this activity is generally one of the most labor-intense ones. The human hand used as handling equipment is hard to be replaced and seldom automated, mainly in tasks involving the retrieval of products. Therefore, the costs of order picking may amount to about half of the operational costs in such environments (Frazelle, 2001; Bódis et al., 2017), so any improvement in this field may result in significant cost reduction (Roodbergen, 2001; Van Den Berg, 1999) and therefore interest in the scientific community has increased to improve productivity in warehouses (de Koster et al., 2007). Moreover, according to the order picking method review offered by Ong and Jospeh (2014), management of time windows are rarely handled, and when done they are usually considered in the delivery vehicles, (cf. Jouglet, Nace, & Outteryck, 2013), or in the customers or clients (cf. Huang, Guo, Liu, & Huang, 2018), leaving aside the consideration of timetables in the products that should be picked, which is an operation of relevance when such products are not available all the time.